IntraWeb which is bundled with Delphi contains powerful components and controls making it easy to develop web applications. 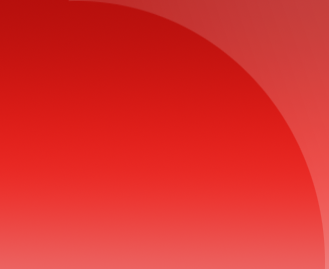 IntraWeb is designed to leverage your native Delphi development skills and take them to the web. In this article we'll show you how to create a simple web application to view multiformat documents stored on the server using Gnostice StarDocs APIs. 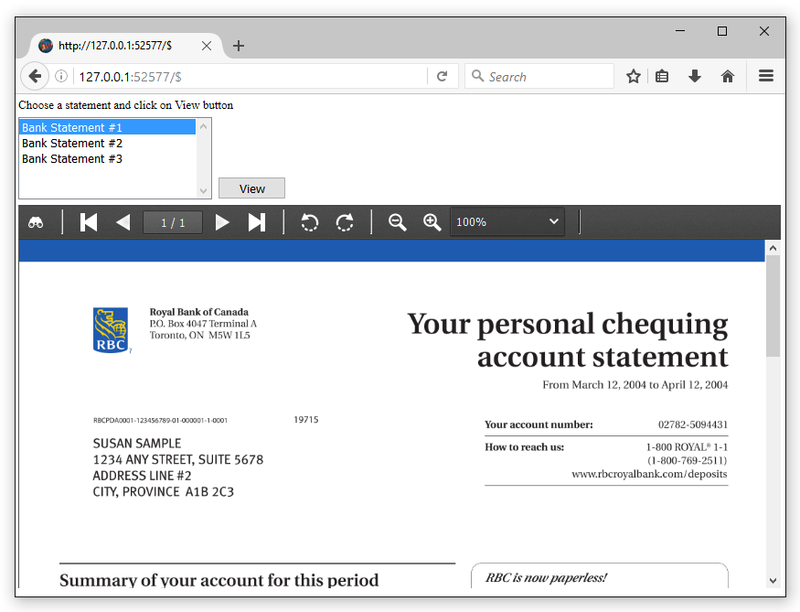 The demo will simulate how a banking application can enable customers to view their statements online. This article uses the Delphi 10.1 Berlin IDE with bundled IntraWeb XIV. However you should be able to follow it for earlier versions of Delphi as well down to Delphi XE7 (StarDocs SDK is supported only from XE7 onward). Here is a short videos covering the topic if you'd prefer watching over reading! However we suggest you also read the article. In the IDE choose File > New > Other. In the dialog that opens choose Delphi Project > IntraWeb > IntraWeb Application Wizard and click OK.
Open the design view of Unit1.pas. Place the following controls on the form: TIWLabel, TIWListbox, TIWButton and TIWURLWindow. Change the caption of IWLabel1 to "Choose a statement and click on View button". Change the caption of IWButton1 to "View". Anchor IWLabel1 to Top, Left. Anchor IWListbox1 to Top, Left. Anchor IWButton1 to Top, Left. Anchor IWURLWindow1 to all the sides. Next let's populate the list box with some sample statements when IWForm1 is created. The code for that is shown below. based on the build configuration. Create a folder called docs there and place a few PDF files under it titled 'statement1.pdf', 'statement2.pdf' and 'statement3.pdf'. Now we will set up the listbox change handler to record the selection. The code for that is shown below. 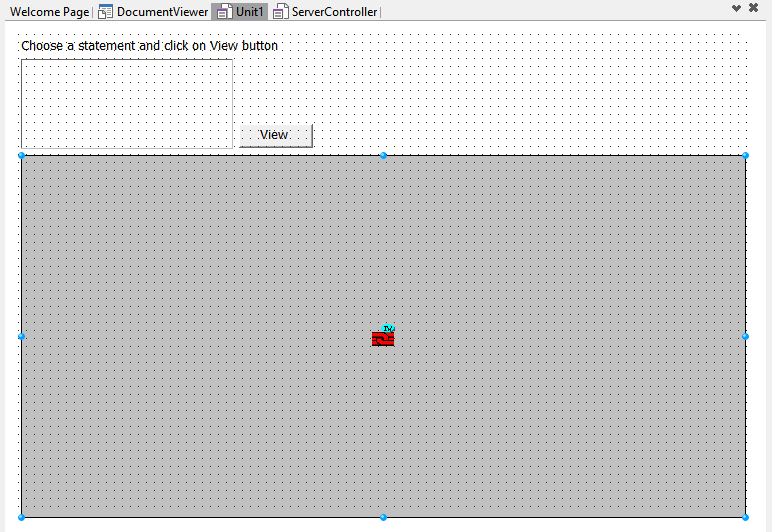 Next let's setup the View button click handler to load and display the statements. Add the following code to do that. StarDocs: TgtStarDocsSDK; // A copy, so don't free it here! That's it! Build and run the application. IntraWeb will show a launcher. You can click on any of the buttons representing different browsers on the launcher's toolbar to open the page of your web application. We have shown below the demo app in action. Note that the viewer can be customized as per your need. For this please see our related article Viewing PDF and image files in your web apps using Web APIs.